On a humid summer night on the platforms of Northfields station, with the last Piccadilly and District line services faithfully plying the tracks, we waited with excitement. We were waiting for the reassuring ‘chuffing’ sound of a steam train in the distance. As it came closer the sound grew louder until, at 23.38, we witnessed the arrival of Met 1 accompanied by her familiar whistle and plume of steam for the first time since the 150th anniversary celebrations of the London Underground in 2013. 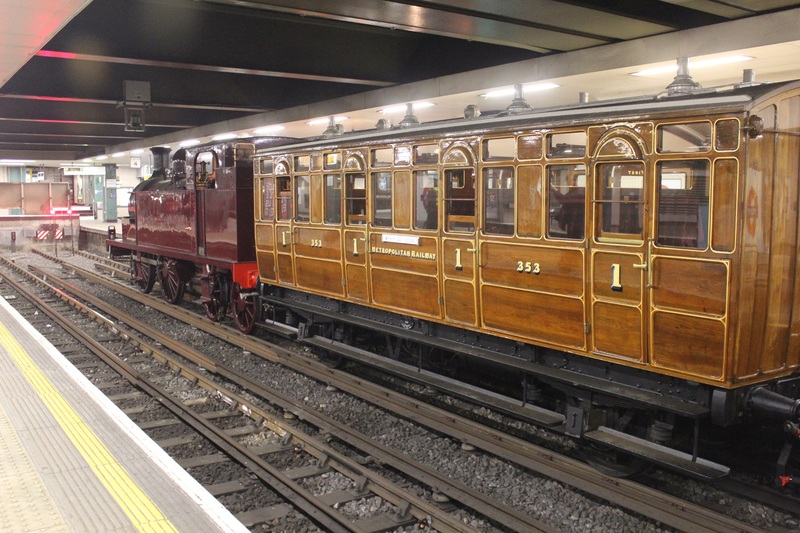 The train, comprising the now familiar line up of Met 1, the Milkvan, Carriage 353, the Chesham set of coaches and Sarah Siddons, was being tested during engineering hours ahead of the Museum’s summer programme of heritage train outings taking place throughout August. Following its prompt departure from Northfields the train, hauled by Met 1, made its way along the District and Circle lines up to Moorgate, surprising unsuspecting late night travellers as it slowly progressed along the line and through near empty stations. 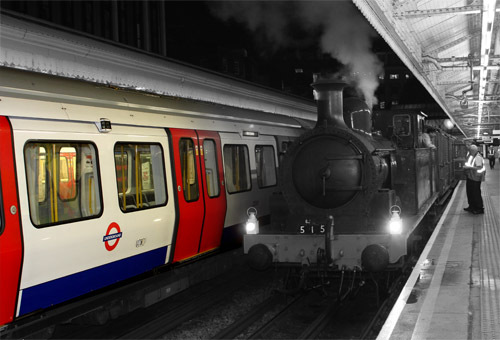 Without a glitch the train soon reached Edgware Road, quickly filling the tunnels of the oldest part of the London Underground with steam, while the unmistakable smell of the coals delighted the senses of everyone who had the opportunity to travel on the train on this warm July morning. After refilling at Moorgate, it was the turn of Sarah Siddons to haul the train, now with a free reign following the shutdown of the system all the way to Hammersmith. The journey was repeated for a second time before the arrival of the dawn chorus and the start of another working day. Over the past four years the University of the West of England (UWE) has been running a poster project for level 2 BA graphic design students. Each year UWE aims to tie the project in with a major national or international event (last year the students produced posters for the 2012 Olympics). This year’s commemoration of the 150th anniversary of the world’s first underground railway fitted perfectly, as poster art has always been such an integral part of the London Underground ‘experience’. 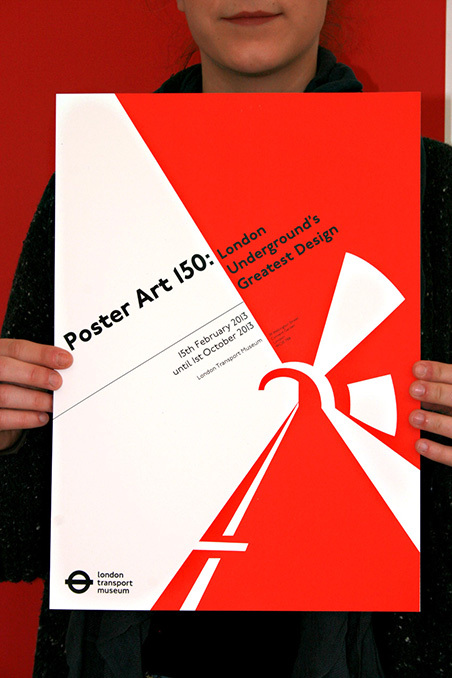 Students were therefore asked to produce an A3 screenprinted, two-colour poster promoting the exhibition ‘Poster Art 150: London Underground’s Greatest Designs’ currently on show at London Transport Museum. We were so pleased with the results, that we got in touch with the Museum and they asked us to write this blog entry to explain more about the project. The design concept for this project is rooted in the traditions of the International Typographic Style, a design style developed in Switzerland in the 1950s. This ‘Swiss Style’ emphasizes clean, dynamic composition, with simple colour schemes and information hierarchy using sans serif typefaces, letterforms and shapes rooted in architectural structure. Students studied the work of celebrated Swiss Style masters such as Armin Hofman, Joseph Muller-Brockmann and Max Bill. They were also encouraged to research the poster collection on the Museum website, which helped them to contextualize their own work and became an invaluable source of inspiration. After research, students were supplied with a simple grid format to work with. They also had a given set of type sizes and the Johnston typeface, designed by Edward Johnston in 1916 and well known for its use by Transport for London. 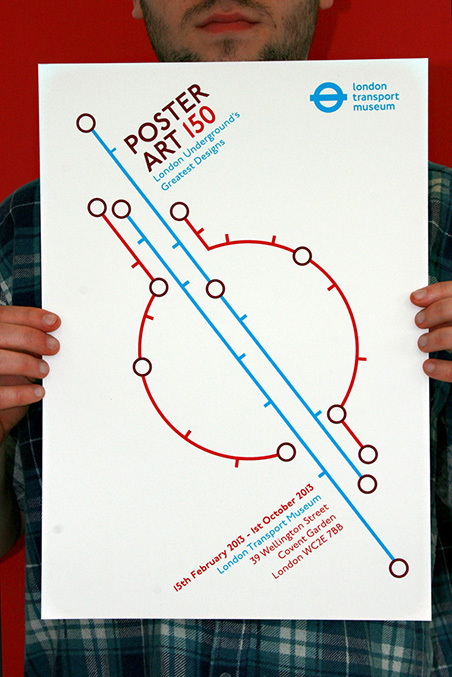 Artwork for the poster had to be created in a one-day workshop and prepped for screenprinting the following week. This emphasized the speed with which transport posters often had to be created during the ‘Golden Age’ of poster design in the 1920s and 30s. ‘The work created by our students saw a wide range and variety of approaches. Some students chose to use familiar and recognizable images of trains, escalators and tunnel architecture. Others have taken inspiration from the sound, colour and atmosphere of the Tube’s subterranean environment. We’ve been really pleased with the students’ work, and it shows they thoroughly enjoyed the challenge of creating work for such an institution as London Transport Museum, and for a hugely significant anniversary. You can see the posters online through the typenowhere site.